A few weeks ago, Federal District Judge Richard Leon ruled against the Food and Drug Administration’s new cigarette warning labels. In a statement, he dismissed the new FDA system as “crafted to evoke a strong emotional response calculated to provoke the viewer to quit or never start smoking.” Judge Leon felt that the proposed illustrations (depicting damaged internal organs, rotting teeth and a smoker’s dead body) infringed upon the free speech of the tobacco companies because they were an attempt by a government organization to prevent a consumer from purchasing a legal product. Certainly one could argue that forcing a company to place a full-color photo of a human cadaver on their packaging could negatively impact sales. Even funeral homes don’t do that and their profits are generated on a per-corpse basis. So I can agree that while a government agency does have the right to assist people in making informed decisions, it is disingenuous to legalize a product and then force the manufacturer to convince people not to buy it by. If anything, those types of heavy-handed tactics should only be used to make a real difference in people’s lives (like when I dropped $15 on the “Spaghetti Incident” CD that Guns N Roses put out). However, the real issue is that the labels are a pointless waste of time. People smoke because they haven’t come to a place in their lives to quit. I cannot name a single adult smoker who wakes up in the morning and asks themselves, “How can I insure I never live long enough to meet my grandchildren by spending $5 every time I stop at a Citgo?” What does the FDA envision happening if this system is implemented? Do they expect some roofer that has been sucking down Camels since he was fourteen to see discolored teeth on his cartoon and suddenly decide that a multivitamin is a better investment? 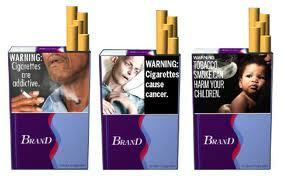 According to a 2009 CDC study, 80% of adult smokers began before they were legally old enough to purchase cigarettes. For those keeping score at home, that means that packaging designed to deter new smokers at the point of sale would, at best, have a 20% success rate. The same CDC study revealed that among high school students the largest percentage of youth smokers were Caucasian males with low “socioeconomic status, grades, and self-esteem” who were prone to “carrying weapons.” This means that taking away cigarettes from a poor white kid could be a dangerous proposition because they are all armed and have nothing to lose. Jose Ole’ Bean & Cheese Frozen Burritos – Box would feature a weeping silhouette on a toilet holding a rosary. Keychain-Size Axe Body Spray – Bottle features an illustration of a man purchasing a Nickelback CD. Nickelback CD – Packaging would feature a morose, goateed man dinning alone at a Carl’s Jr.
Bowflex – On the box is a photo of the Bowflex beside your Ab Roller at a yard sale. A “TapouT” Window Decal – The packaging would be the same, but the clerk would punch you in the face upon checkout. As George Carlin said, government is ramming it's ... well it is Carlin, use your imagination. This is just one more way the government is taking away our ability to think on our own by stepping in and making decisions for us which are in "out best interest". Sorry Big "G", I have a brain and I intend on using it. What is government going to take away from us next?